1 of 2 Heat oven to 400 degrees . Unfold pastry sheets on a cutting board and cut each into 6 equal pieces. Roll one piece out lengthwise to 7 inches. 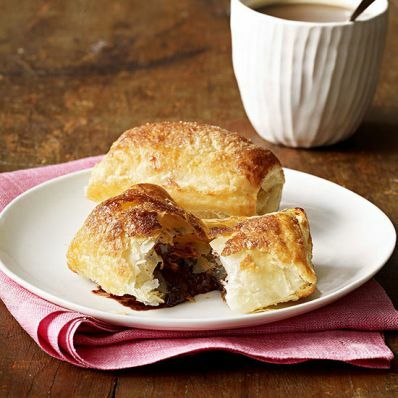 Brush edges with egg wash. Place a scant tbsp chocolate in center of pastry. Top with 1/2 tsp raspberry jam or orange marmalade. Starting on a short side, fold one end over chocolate, then fold over other end to resemble an envelope. Place on a baking sheet. Repeat with all pastry pieces, chocolate, and jam or marmalade. Brush pastries with egg wash; top with sugar. 2 of 2 Bake at 400 degrees for 18 minutes or until puffed and golden brown. Cool slightly before serving. Per Serving: 2 g fiber, 4 g pro., 205 mg sodium, 241 kcal cal., 16 g Fat, total, 18 mg chol., 5 g sat. fat, 23 g carb.